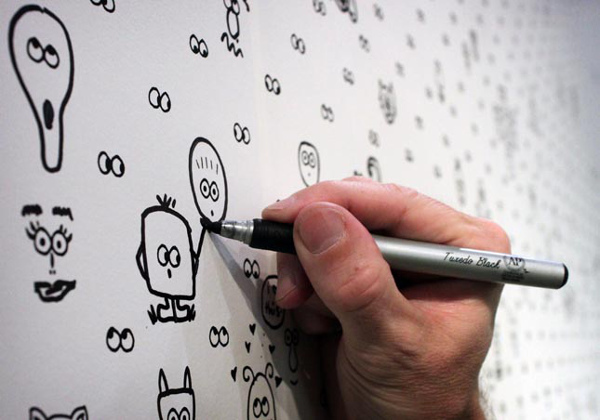 For a unique twist on the ‘colour your own’ wallpaper idea, click through to ‘see’ this new design from Cavern. Designer wallpaper is not usually the first thing you’d be willing to let your kids near with a Texta. There is no doubt that wallpaper has had a resurgence in recent years. No longer relegated to your grandmother’s formal lounge room, there are a whole host of funky wallpapers out there, even a handful of ‘interactive’ wallpapers with the option to colour them in, and then there is this very cool offering from boutique wallpaper firm Cavern. Cavern are based in New York and Los Angeles and produce hand silk screened wallpaper. 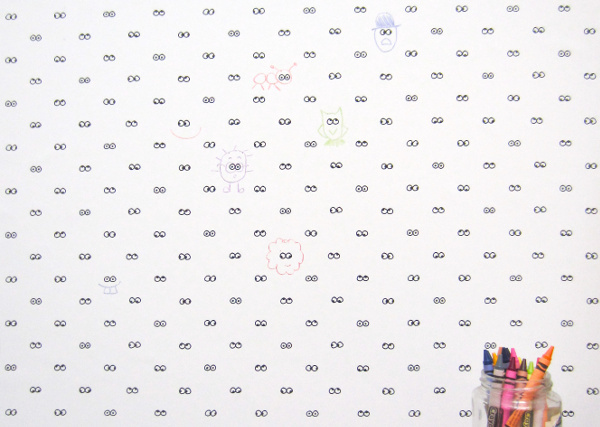 Their I See You wallpaper features hundreds of cute, googly eyes looking every which way. Far from being terrifying, all these eyes are simply begging to have characters drawn around them, and this is exactly what the designers at Cavern had in mind. From little animals to cute faces, the owners of all these eyes are entirely up to your little artist. ‘I see you’ wallpaper is US$155 a roll plus postage and is available direct from Cavern. Check out our previous posts on Dress Me Wallpaper and Burgerdoodles for more interactive wallpaper ideas.